Happy Thursday! 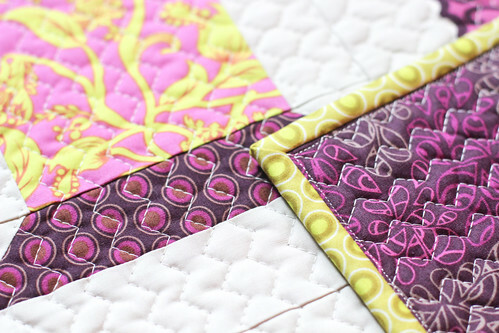 It's time for another mini quilt! As I mentioned earlier this month, I've been busy making a few birthday mini quilts this Spring and I'm going to share one each week. This week's mini is for Holly! Holly is one of the few people I know that loves purple as much as I do. After a weekend get together a few months back, we discovered how much we are truly alike. Isn't that the best? 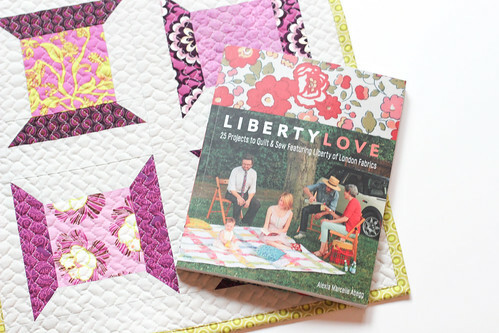 Anyways, I knew I had to use purple in this mini quilt, and I knew Holly had a liking for Alexia Abegg's Liberty Love book! I went with the Classic Spools Quilt. It was really fun to stitch up! 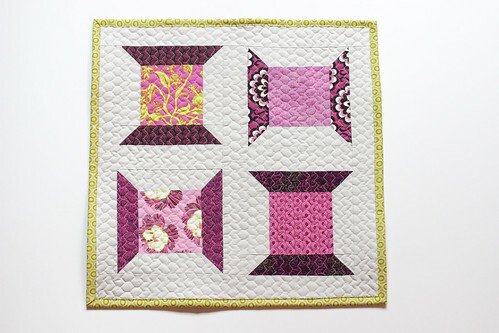 I made just four spools and turned two on their sides to give the little quilt a bit of extra interest. I focused on eggplant and orchid purples with a little pop of lime green to mix it up! I quilted it with 50wt Aurifil thread and the three-step zig-zag stitch. I used Pure Element sandstone for the background, along with blenders for the backing and binding. All of the fabrics used are from Art Gallery Fabrics. Super cute and I love the color mix! In the first pic, I thought you'd quilted your mini with a hexie pattern. Those zigzags are very sneaky! I'll be filing that one away for future use! so cute!!! You are rocking all the minis!!! I love it. I am a purple girl too. 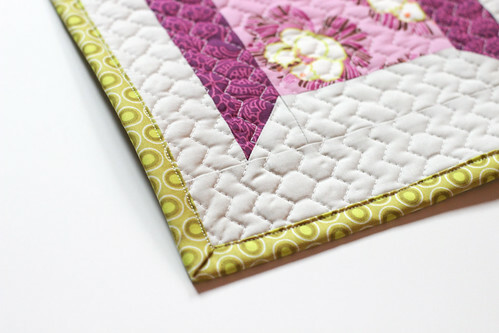 The quilting looks great. Perfect gift! Love the purple and lime combination. Cool quilting too that makes the spools look really 3D! I love this. Such great color combos. three stich zig zag-too cool. will be a nice change from my serpentine stitch. I love these colors. Very luscious.